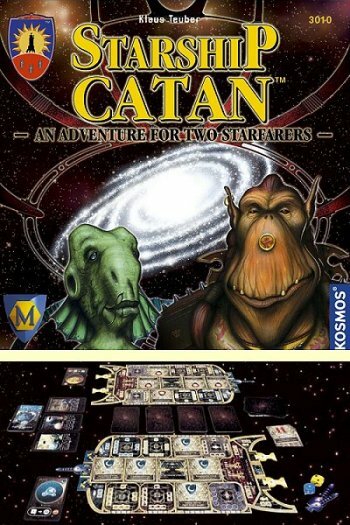 In a flash, two Starfarers from the Catan space fleet have been thrown through a mysterious wormhole into an unknown galaxy. Lost, dazed and unable to find their way home, and with limited resources, the brave explorers face a seemingly hopeless situation, until they meet four peaceful alien races. These friendly aliens offer them limited aid and will guide them home if they can meet the high standards required for entrance into the Galactic Advisory Council. Now you can take the role of a Starfarer and daringly brave the unknown reaches of space! Battle dastardly pirates, explore & colonize new worlds, strike vital trade agreements, performing missions of mercy, rescues, and interventions, all while improving and preparing your Starship for the journey home. If you work hard, choose your course carefully and with vigor, you will attain membership in the Council and learn the way home. Another great two player game with a fun sci-fi theme. No experience with Catan is required for this game. My favorite part of the game is the discovery element in exploring the decks of cards.